Cosmetic services are in high demand as patients realize the importance of a beautiful smile. We provide aesthetic treatments used to achieve the smile patients desire with the use of services such as dentures, dental implants, composite resin bonding, and professional-grade teeth whitening. 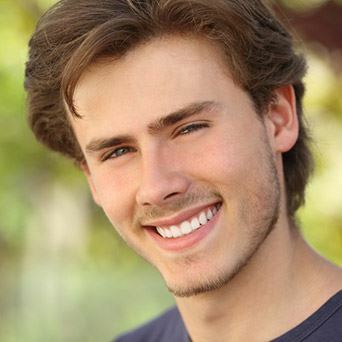 Cosmetic dentistry in Santa Clarita is one way for patients to obtain a more beautiful smile. While cosmetic dentistry was once thought of as a way for the Hollywood elite to enhance their look, it is now more affordable and attainable than ever! Cosmetic dentist in Santa Clarita, Dr. Sarkis Aznavour of Healthy Smiles Dental, is excited to offer a variety of procedures for patients to consider for a brand new look! Porcelain veneers – veneers are a great way for patients to change the appearance of the anterior teeth in the front of the smile. These are ceramic “facings” bonded over the front to disguise imperfections such as breakage, permanent staining, and gaps between teeth. Dental implants - replacing missing teeth with implants is a smart decision for patients seeking permanent repairs. Implants are versatile and can replace one or several teeth within the smile. Orthodontics – straightening misaligned teeth can greatly impact the appearance of the smile. Our practice offers both Invisalign tray therapies and traditional metal bracket and wire braces. Dental crowns – crowns can provide coverage for teeth and improve the overall appearance, while also being placed over abutments on dental implants to act as false teeth. They can also be used with pontics to fabricated dental bridges. Composite bonding and fillings – tooth-colored fillings are achieved with composite resin bonding and can fix areas of decay in a more aesthetic manner than silver fillings. Our dentist works with patients in designing the smile they’ve always wanted! Whether they need small, subtle changes to their appearance or are interested in completely transforming their look, they can turn to the team of Healthy Smiles Dental for smile design services. From start to finish, our team can complete a dental plan that works for you! If you are interested in learning more about cosmetic dentistry or any other procedures available at Healthy Smiles Dental, we encourage you to book a consultation appointment with Dr. Sarkis Aznavour by calling the front office staff at (661) 210-4280. The practice is conveniently located at 24242 Lyons Avenue and offers a wide selection of services for new and existing patients. or our dental specials available. Patients in and around the area of Santa Clarita seeking a quality dentist in the community are welcome to connect with Healthy Smiles Dental to schedule a free consultation appointment. Call (661) 210-4280 today to learn more about the services provided.